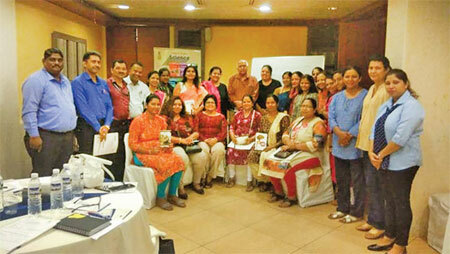 Virender Kapoor, an author and educationist, who inspired principals and teachers at his special crafted workshop ‘Creating Vibrant Educational Institutions through Effective Leadership’ that took place in Margao recently. The workshop was organised by S Chand And Company Pvt Ltd, who has published a couple of books written by Kapoor. The workshop included principals and faculty coming in from 20 schools across Goa. Kapoor is a management guru and former Director of Symbiosis Institute of Telecom Management, Pune. His bestselling books include ‘Excellence: The Amitabh Bachchan Way’, ‘Succeeding: The Akshay Kumar Way’, ‘Leadership The Gandhi Way’, ‘Innovation: The Einstein Way’, ‘Speaking the Modi Way’, A Wonderful Wife’, ‘Wonderful Boss’ and ‘What You Can Learn From Military Principles’. His belief that inculcating values in children from a young age is beneficial and important led him to write a series of value education books for schools, called ‘Life with Value’. Virender Kapoor has influenced thousands of management and corporate students who are now in high places. At the workshop, principals and teachers learnt about creating effective and deliverable leaders from the master himself. The main aim behind the workshop was to ingrain creative teaching methods and good leadership skills. The primary topics discussed during the workshop included understanding emotional intelligence, leadership in education institutes, building organisational culture, politics is dangerous, managing people, emotional sensitive leaders, delayed gratification, loyalty and determination in the light of EI, inculcating values and EI in children. Based on the focal theme of your workshop, what is the responsibility of a principal? The most important job of a principal is the task to build a strong foundation based on values and culture. It is essential for a futuristic, creative and understanding person to be given the seat of the principal. Mind you, it is not an easy job! The principal has to wear different hats while dealing with each department in an organisation. The behaviour and correspondence with the staff, the interconnection with students and the interaction with the parents require different roles accordingly. Teaching values in schools is a burdensome task, as the children spend more hours at home and less in the institute. What is your opinion on the education system today? Let me tell you something striking. I find the use of ‘PowerPoint presentations’ impractical. It is an undeniably stupid action. If you use PowerPoint, there is no power in your point. Students learn to be confident when they are taught to stand up and speak, and this is the work of educationalists. Having practical experiences, conducting subject-related activities and giving real life examples are best ways of learning, through which the teacher and learner enthusiastically enjoy the atmosphere. Moreover, a bond between the teacher/principal and student is built. Emphasising on values, ‘Life with Values’ is one of your books for school students; according to you, how important is it to teach moral values to children? Value education is often given less importance in schools than other mainstream subjects. But naturally, value education should receive more credits, as it structures the right discipline in a child to be a better citizen of the nation tomorrow. When no boundaries are set, disciplining a youngster is difficult; they grow up to create menace by forgetting simple basic ethics. What difference do you find between the ethics of India compared to the Western countries? Honestly, in India, we take pride in breaking rules, while they take pride in making rules. Hence, the next time citizens remember to criticise India, one must keep in mind that each individual is responsible for their actions. When it comes to teaching values and inculcating good habits, is it an easy task? No. As an educationist, I agree that it is easy to teach subjects like science, mathematics, chemistry, etc as these subjects are based on facts. But inculcating values in children is a tedious procedure. How would you prefer teaching a child moral values? Giving examples of historic figures like Mahatma Gandhi or Mother Teresa is unhelpful. The past lies in the past and might even get boring. Youngsters today believe in seeing more than hearing, hence having a historic person as a role model would be futile. However, when one looks forward to bring the best in a child, common examples of their favourite inspirations or celebrities, perhaps even a good film would help them learn and grow with indefinite values. In my books of ‘Life with Values’ I have given examples of famous modern people. Children like these people; it helps them build an attachment. : What are the books you are currently working on? My series began with ‘Leadership the Gandhi Way’ and I am currently working on the new edition- ‘Winning the Chanakya Way’. What message do you have for educationalists? This is something what I always say during my workshops: Whether it is a company position or a principal’s seat, don’t’ worry about the cost of the chair; when you sit on the chair, you create the value of the chair. Sitting on the chair of a high position doesn’t make one eminent, but the kind of personality you define yourself into is what makes you a person of great importance. Every teacher aspires to be a principal one day and therefore needs to learn what it takes to become a remarkable school leader.